Digital cameras are always changing, adding new features and improving old ones. The technologies appearing in today's cameras were initially discovered several years ago, perhaps even for a different purpose, before becoming part of the mainstream camera world. Here are some of the most interesting and promising changes coming to digital camera technology in the near future. Cameras of the future may no longer require a shutter button. Instead, photographers could wink or use a voice command to tell the camera to record a photo. In the case of a wink, the camera probably would be built into a person's glasses or another everyday item. With the camera built into a pair of glasses, aiming the camera would be easy, too. This type of camera potentially could work in a manner similar to a hands-free cell phone, where you can issue commands without the need to push a button. An ultra-compact camera generally is defined as a camera that measures 1 inch or less in thickness. Such small cameras are great because they easily fit in a pants pocket or a purse. The camera of the future could redefine "ultra-compact," though, creating cameras that could be 0.5 inches in thickness and maybe with smaller dimensions than today's cameras. This prediction makes some sense, as digital cameras from a decade ago were much larger than today's small models, and the high-tech components inside digital cameras continue to shrink. As more cameras incorporate touch screens for operating the camera, the camera's size could be determined by the size of its display screen, eliminating all other controls and buttons, much like a smartphone. Photography is a visual medium, but the camera of the future may add the sense of smell to photographs. Adding the ability to stimulate senses other than vision to photographs would be an interesting idea. For example, a photographer could command the camera to record the smell of the scene, embedding it with the visual image that it captured. The ability to add smells to photographs would need to be optional, though ... adding smells to a photograph of food or a field of flowers would be great, but adding smells to photographs of the monkey house at the zoo might not be desirable. Today's rechargeable batteries in digital cameras are as powerful as they've ever been, allowing at least a few hundred photographs per charge. However, what if you could charge the camera automatically as you're using it, without the need to be plugged into an electrical outlet? The camera of the future could incorporate some sort of solar energy cell, allowing the battery to either operate only from solar power or allowing it to charge the battery using the solar cell. Some questions would have to be answered first, such as how much the solar cell would add to the size of the camera. Still, though, it would be nice to have a built-in solution to prevent the problem of a dead battery. Olympus' effort at setting its ultra-zoom SP-100 camera apart involves giving this model a futuristic Dot Sight mechanism that will help you track far-off subjects while the camera's powerful 50X optical zoom is fully engaged. 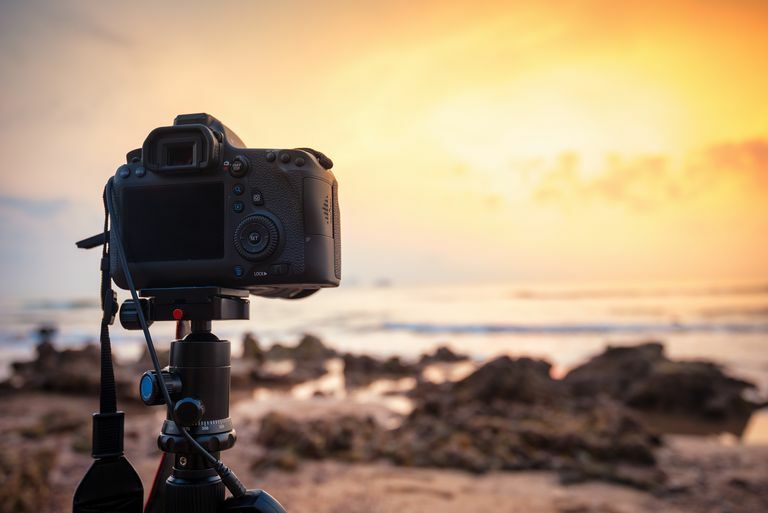 Most photographers who have made use of cameras with long zoom lenses have experienced the problem of having a subject move out of the frame while shooting over a long distance with the zoom in use. The Dot Sight is built into the pop-up flash unit and gives the SP-100 a unique feature. You certainly won't find this type of feature on any other consumer-level camera. Lytro cameras have been employing light field technology for a few years, but this idea may become a bigger part of general photography soon. Light field photography involves recording the photo and then determining which portion of the photo you want to have in focus later. Cameras that excel in low light -- or no light -- photography are on the way. The ISO setting in a digital camera determines the sensitivity to light for the image sensor, and a setting of 51,200 is a common maximum ISO setting for today's DSLR cameras. But Canon has unveiled a new camera, the ME20F-SH, that would have a maximum ISO of 4 million, which effectively would allow the camera to work in the dark. Expect more cameras in the future that can match this model's low light performance level ... and exceed it. Digital Camera Glossary: What Is ISO?